Realme 1 is a new budget smartphone from Oppo which aims at the users who wants amazing build quality without compromising on the internal specifications. The device comes with a sturdy diamond back which looks and feels very premium. The internal specifications are enough to give you decent performance without any major issues. There is no fingerprint sensor available on the device. But on the contrary, you do get a very fast face recognition feature which in my eyes is a great thing. Oppo Realme 1 is a great step forward by the brand to give budget packed devices. There are various aspects that this smartphone does pretty well if compared to the competitions. First of all, the design here is something which you&apos;ll never see in any budget smartphone. The diamond back gives this device a unique sense of feel. When it comes to battery and overall performance, the device lives up to my expectations. You still might not like the cameras. Oppo Realme 1 is a budget device which I bought on the very first sale. I&apos;ll come to direct pros and cons of the device without wasting your time. If you&apos;re looking for a device which has a solid build quality and unique design then you might like this device. I really liked the battery backup which is just fantastic. When it comes to downsides, the device comes with single cameras as compared to competition which are offering dual cams. No fingerprint sensor but you do get the very fast face recognition feature. A smartphone which offers unique design and great premium feel at this price is just fantastic. For the icing on the cake, the smartphone gives excellent battery life and decent performance. When it comes to optics, I found the cameras to be just an average but you can&apos;t expect everything at this price. An addition of fingerprint sensor would be nice but sadly it doesn&apos;t have one. On the other hand, the face recognition tech on this smartphone is very fast and authentic. The Realme 1 is a good overall device which does most of the things perfectly. I liked the design and premium feel which is not that common in this price range. Cameras are okay but not that great though. There is no dual camera setup which disappoints me since every other phone comes with it. There is no fingerprint sensor which is also a huge issue for me. I would like to have the option of both fingerprint and face recognition. Other than that, I really liked the device. It is offering great performance as compared to other brands. The phone&apos;s performance is brilliant and does not lags. There is a huge 6GB RAM and 128GB storage space. Overall it is a great phone at a great price. None I have experienced yet. 13 Pricebaba users have written their experience with Realme 1 128GB. 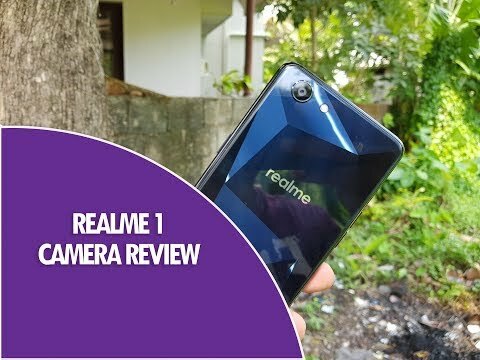 If you own Realme 1 128GB, please do leave your feedback too. Lowest price of Realme 1 128GB price in India starts at Rs. 13,300 Realme 1 128GB is available on Flipkart at Rs. 13,300. Prices updated on 18th April 2019. On the front side, the Realme 1 features a 6-inch Full HD+ bezel-less display bearing a resolution of 2160 x 1080 pixels. The screen has a 18:5 aspect ratio that provides an immersive viewing experience. There is a 3.5 mm headphone jack for plugging any audio accessories. Design-wise, the device sports a diamond shaped pattern on the back which looks stylish. The Realme 1 ships in three attractive color variants i.e. Diamond Black, Moonlight Silver and Solar Red. On the imaging front, the Realme 1 features a 13MP rear camera accompanied by an LED flash. For selfie enthusiasts, there is an 8MP front camera capable of clicking good quality pictures. The camera software has features like continuous shooting, and high dynamic range. On the hardware front, the Realme 1 is powered by a 2GHz octa-core MediaTek Helio P60 processor. It packs 6GB RAM and a Mali G72-MP3 processor onboard. For storing your data, this device offers 128GB internal memory. It is expandable up to 256GB via microSD card slot support. The Realme 1 runs on the latest Android 8.1 Oreo OS with Oppo’s custom ColorOS 5.0 skinned on the top. The Realme 1 is backed by a 3410 mAh non-removable battery. It has dual SIM card slots and nano SIM cards are compatible with this device. For networking purposes, the Realme 1 has all the basic connectivity options like 4G LTE, 3G, 2G, WiFi, Bluetooth and VoLTE. It also supports Dual 4G VoLTE. Ans: You can expect great selfies with 8MP front camera. 2. What type of SIM card do I need? Ans: For communication, you will require a Nano SIM card. 3. Does the phone support OTG? Ans: Yes, a OTG cable can be connected to this phone. Ans: Inside the box, a device, charger and cable separate and a user manual is included .